A New Yorker himself, Schechtman presented a case for the streetcar by confirming what most commuters observe every morning: Buses are feeders from the subway, while existing subway lines are overcrowded. Ferries, meanwhile, can only accommodate only 3,000 riders per day. The streetcar is a “Goldilocks solution,” enthused Schechtman, who, prior to joining engineering firm Sam Schwartz in 2001, spent nearly 32 years at the MTA, including nine as the vice president of operations. The catenary-free, battery-powered streetcars can carry 175 passengers, compared to the Select Bus Service’s (SBS) 100. The route map that’s circulating in the media is a “very and deliberately vague description of the route,” explained Schechtman. “The BQX project is a project in motion.” Even so, Schechtman was able to lay out some specifics: When it begins operations in 2023, the streetcar will glide along a 15 mile north-south route from Astoria to Sunset Park, with 30 stops, each about a half-mile apart. Exclusive lanes, where streetcars can travel at 12 miles per hour, will comprise about three-quarters of the route, while 15 percent of the tracks will feature a contiguous-with-the-roadway, “SBS-style” design, that will slow travel to 10 miles per hour. Trains will arrive five minutes during rush hour, and every ten minutes off-peak; Sam Schwartz estimates that daily ridership will reach 52,000 by 2035. Schechtman had strong words for those who view streetcars, like the one in car-dependent Dallas that has 200 riders per day, as dinky tourist boondoggles. “The [streeetcars] that are failing are the ones that were failing when they went to the drawing board. These efforts give streetcars a bad name. 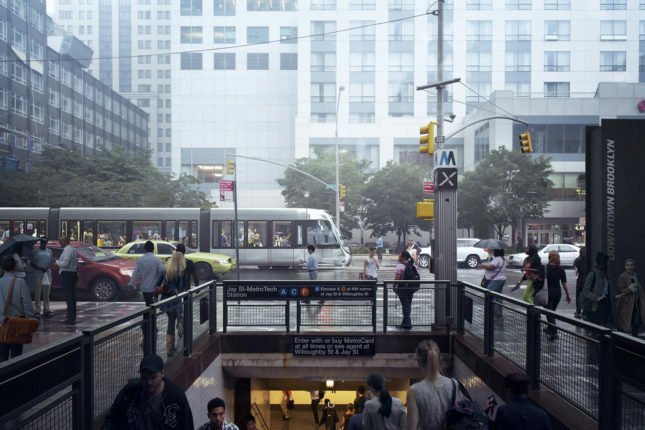 The BQX is not a cute tourist attraction, but real transit that carries a helluva lot of people.” The annual operating costs are estimated to be between $26 and $30 million, with $17 million in projected fare revenue. With the MTA struggling to finance even basic capital improvements, where is there money for a new infrastructure project? The BQX is a NYC DOT project, and thus operates outside the MTA’s purview. Its design relies on existing zoning, doesn’t compete with other development priorities, and assumes a 3.5 percent growth in taxes that go to the city, according to Schechtman. The biggest cost will be the relocation of below-grade utilities. AN reached out the DOT and the Mayor’s press office, but as of this time AN has not been able to confirm Schechtman’s description of the planning and review process. The public input process has just begun: on May 9, a public meeting was held in Astoria, and on May 19, another meeting will be held in Red Hook. A draft of the final route should be ready by the end of this year. 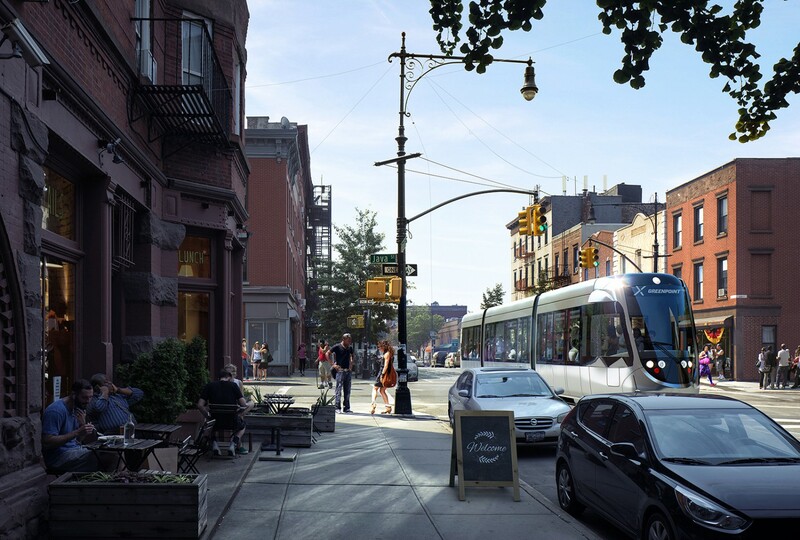 In the meantime, check out the Friends of the BQX’s recently launched website for updates, project FAQs, and a spate of shiny new streetcar renderings.